Transfers the five major cities into the Tamriel worldspace, eliminating the load screen transitions. Ride your horse through town, or seek aid from city guards in a fight. Magistrate Levitate (formerly Levitate Revamped) Recommended - It is not mandatory, but you will need it if you want to enter/exit cities without transition doors. BassEX - Corrections made to the Markarth dam mesh. jonwd7 - Fixing the collision on 6 Whiterun wall pieces without normal collision height. [email protected] - For having the patience and dedication to dig deep into the civil war and ferret out problems causing it to fail in Solitude. Dwip - For numerous improved meshes at the various city gates. No more crappy fake collisions! nonoodles - Riften southeast gate mesh plus the animated dock gates. Markarth: Tyrranus and Yngvar would not always be in front of the abandoned house to run their scene because the scene script was placing them in the closed worldspace. Thanks go to Nico coiN for this update. All of the work was his! Windhelm: City gate mesh fixed to have proper collision on the entire door, along with an adjustment to slow the animation speed a bit. Windhelm: The main city gate trigger was set to the wrong enable state and was not autoclosing the gate when the player left the area. 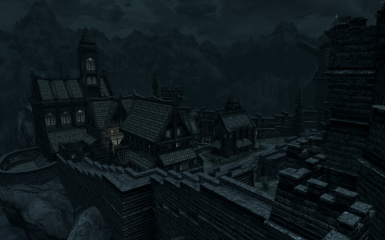 Windhelm: Fixed the area along the southwest exterior wall so that it no longer extends past the original city wall. Removed several edits to ground objects that were no longer needed. Solitude: Repositioned 3 partially buried barrels outside of the Winking Skeever. Markarth: Patched up the terrain visible in the tunnel leading to Cidhna Mine. Markarth: Gave the main city gate a custom mesh with a proper length sound animation to go with it. Riften: Removed two unneeded edits to vanilla trees outside the southeast gate. Added one tree inside the gate that was missing from vanilla. Riften: Grounded a floating wall idle marker that caused guards to hover above the ground. Other: French translation added to the MCM. Thanks Nico! Riften: Missing script on the Thieved Guild map marker trigger. Whiterun: Removed navmesh edits to Breezehome as they are no longer needed. Whiterun: Added the 3 missing totems that were in the vanilla worldspace. Solitude: Removed navmesh edits to Proudspire Manor as they are no longer needed. Solitude: Adjusted patrol markers at the archery practice in the castle courtyard to match up with USLEEP 3.0.5. Switched to Legendary Edition. All future support will remain on this branch ONLY. Markarth: Placed city banners for Markarth outside of Understone Keep. Strongly recommend the use of USLEEP in order for these to display correctly. Windhelm: Fixed issue with dock mesh having odd black patches on it. (Tangent spaces needed updating). Solitude: If an alternate start mod placed you inside the Winking Skeever, Roggvir's execution scene would not be triggered upon exiting. All cities: Various synchronization fixes for USKP edits to repositioned markers and other objects, up to USKP 2.1.3. All cities: Adjustments to preferred pathing for the navmeshes have been made to correct some minor anomalies in NPC path choices. Riften: The 3 gates behind Riftweald Manor were never properly locked as they should be prior to The Pursuit (TG07). Windhelm: Bounds radius data on WHBrunwulf has been adjusted to hopefully prevent Brunwulf's house from disappearing when it loads. Solitude: The Civil War battle failed to swap the doors due to a missing object that was supposed to be holding the script used for this. Windhelm: Triggering the setup for Blood on the Ice (MS11) was competing with scene fragments on the vanilla side that move the NPCs to their start locations. This would cause the NPCs to sometimes end up having to walk back to the open world side. The scenes themselves have now been edited to eliminate this problem. Whiterun: Eorlund Grey-Mane went to the closed city to reforge Wuuthrad due to his package being linked to the furniture object. Whiterun: Entering the Underforge prior to your rampage through the city should now put you at the correct marker when the rampage starts. The script was checking the wrong quest stage and not updating properly. Markarth: Dryston was not being positioned at the proper marker during Forsworn Conspiracy (MS01). Whiterun: Vilkas' forcegreet package when the player returns for Purity of Revenge (C05) was still checking the WhiterunWorld worldspace. Whiterun: Eorlund's package to reforge Wuuthrad was still assigned to the Skyforge in the WhiterunWorld worldspace. Whiterun: Enable markers for Kodlak's funeral were not set to use the vanilla markers as toggle parents, so the Pyre would never actually light on fire. Whiterun: All NPCs who attend your induction ceremony should now be in place and waiting from the moment you enter the city instead of the possibility of a short delay while they navigate out of the closed worldspace. Markarth: Two more AI packs needed to be edited to make sure the Forsworn would fight and then flee properly after MS02 is ready for them to. Whiterun: Added a smelter and workbench to the Skyforge. Whiterun: Fixed several trigger boxes for Companions quests that were not operating 100% correctly. Windhelm: Cleaned out several unnecessary navmesh edits. This eliminates the need for the OCS+Dragonborn patch file. If you are using this, please delete it. All: Several improved meshes have been provided by Dwip, or modified from vanilla by Dwip in order to fit the city gates better. Several redundant meshes have been removed from the mod as a result. 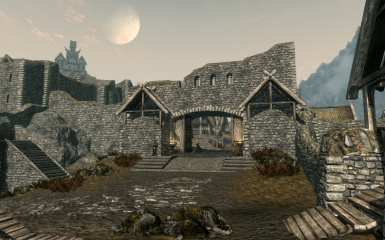 All: Navmesh edits to all interior cells (except Breezehome, Proudspire Manor, and the Thalmor Headquarters) have been removed to better facilitate compatibility with mods that alter interior navmeshes. Fixes synced from USKP 2.0.4. Markarth: When siding with the Forsworn, Madanach and company will now flee the city properly, fighting until the appropriate time, then running for their base at Druadach Redoubt afterward. Riften: Added new meshes to make the canal gates animated so they can be opened and closed. Courtesy of nonoodles. Riften: Trim gap and wall seam repaired on the new southeast gate using old USKP mesh to copy parts from. Whiterun: The player should no longer be dropped into the wrong worldspace for the werewolf rampage due to an unreliable transfer script. Riften: Added a new mesh for the southeast gate. No more mysteriously boarded up passage to a major road. Courtesty of nonoodles. Riften: Reversed a USKP edit that caused the major landscape tile in the city to separate from the boardwalk and sink slightly. Riften: The replacement meshes for the outer walls (to put moss on both sides) were in the wrong folder. Solitude: Covered up several large gaps in the archway rocks outside the city wall. Adjustments to synchronize fixes with USKP 2.0.1 and USKP 2.0.2. Markarth: Fixed a bug during No One Escapes Cidhna Mine (MS02EscapeMadanachEnding) where the guards accompanying Thornar would be in the wrong worldspace because their AI does not move them. All: Many buildings were missing their exterior window lighting effects. Whiterun: Some stray landscape edits the mod doesn't need have been removed to reduce problems with compatibility outside the city walls. Adjustments to synchronize fixes with USKP 2.0.0. Whiterun: The city gate now has a properly combined gatehouse mesh with real collision instead of crappy collision planes and a bad landscape hack. Riften: The Argonian north gate attendant now has a voiced dialogue line. Markarth: The large dam that makes up the southern portion of the east wall now has real collision and the duplicated mesh parts have been trimmed, along with the fake collision planes removed. All: The gate attendants did not have persist locations set, so their AI schedules were not running properly. Whiterun: Due to continuing minor complications, the Battle of Whiterun will now take place in the closed city for both Stormcloaks and Imperials. Solitude: Due to continuing complications in the civil war, the Battle of Solitude will now take place in the closed city instead of in the open. Whiterun: Fixed an error in the script that turns off the LOD lights that was allowing more than just actors to trigger it, generating immense lag. Reversed the alterations to the vanilla city map marker data due to the fact that an engine bug causes the change to become permanent. UGH. Riften: Removed some previously unnoticed duplicate walls and buildings. Should help with performance now that those are gone. All: Navmeshes in every edited cell have been refinalized. Whiterun: Several piles of civil war rubble were attached to the wrong enable parents. Riften: Added a smelter to the blacksmith's area and moved the wood piles that were there around the corner. Whiterun: Fixed remaining issues with Companions quests that take place outdoors in the city, especially at the Skyforge. Whiterun, Riften, Markarth: Jury-rigged the map markers so that they will drop you into the open city space regardless of when the mod was installed. Whiterun: Heimskr's AI routine and rant scene needed the markers changed so he wouldn't run off to the closed worldspace like an idiot. Whiterun: Fixed the navmesh connection from the closed city so the NPCs could actually get out and go about their normal routines. Whiterun: Fixed a portion of the Companions quest that was broken due to the markers refusing to move to the open worldspace. Reattached Update.esm as a master to prevent wiping out any vanilla fixes I might run into now that some AI packs and quests are in need of tweaking. Riften: Fixed a bug that caused the quest "A Chance Arrangement" to fail intermitently due to Madesi's strongbox not getting the ring added properly. 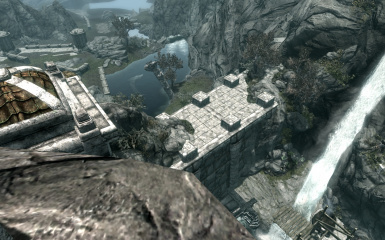 Markarth: A corrected mesh for the dam on the south side of the city has been provided by BassEX. Markarth: A collision plane has been added to prevent people from walking through the altered dam mesh, until such time as the collision can be repaired properly. Fixed improper initialization of the MCM menu. Solitude: The bridge scene during To Kill an Empire (DB09) would freeze the player's controls out and never re-enable them after Maro's monologue. Solitude: Maro's monologue scene in To Kill an Empire (DB09) had him delivering it from behind the 3 guards due to the lack of a navmesh at the scene marker he's supposed to use. Solitude: Vittoria's wedding scene during Bound Until Death (DB05) was not functioning correctly due to the lack of a navmesh on the balcony where she gives the speech. Solitude: Some of the audience members for Vittoria's wedding were not in the correct worldspace due to the AI markers not having been moved properly. Riften: The landscape edits under the south gate somehow got lost, leaving an ugly gap below the road. General: Syncronized fixes from updates to the USKP. General: Implemented a SkyUI MCM menu to provide a means to enable or disable the following: Oblivion Gates, City Gate Attendants, Outdoor Lighting System. General: Removed several navmeshes that the mod does not need to edit, which should help improve compatiblity with mods that edit things near the cities. Solitude: The decorations for the wedding scene during the Dark Brotherhood are never cleared once the quest is done. This fix will rely on the USKP to trigger it at the appropriate time. Riften: Added another AI door for the children at the orphanage to prevent them from sometimes getting stuck outdoors in the closed worldspace. Markarth: Fixed the trigger that modifies Dryston's ambush and brawl scene during Forsworn Conspiracy (MS01). Solitude: One of the civil war fires was not hooked up to the enable parent properly. General: The script which fixes broken positioning on the original vanilla gates has been modified so that it will only attempt to execute once instead on every reload of the area. All: Old script assignments attached to the player house doors have been removed so they won't block access to the real ones. All: Hana upgraded her Oblivion gate meshes to use real collision. The fake collision cubes have therefore been removed from the game. Improved textures have also been provided. All, except Windhelm: Outdoor lighting in the cities will turn on and off for day/night changes. Windhelm will not be covered since the outdoor lighting doubles as sources of warmth. Whiterun: A barricade outside the Drunken Huntsman was not tethered properly to its enable parent. All: The gatesmen for the cities have all been transferred to interior start locations so the civil war quests that send everyone indoors will take them too. Solitude: The cell SolitudeMountainside was not properly listed as being in SolitudeLocation and was disrupting civil war data for the city. Solitude, Whiterun, Windhelm: Location reference type markers have been stripped from the closed city markers to prevent them from stealing aliases from their open city counterparts during the civil war. Solitude: The birds that fly overhead will now be disabled during the civil war battle. Whiterun: The Stormcloak assault on the city should now be working properly. Mod has been cleaned with TES5Edit. Yay! No more dirty edits or deleted records in the way! Whiterun: Fixed navmesh edits in Breezehome to avoid a CTD conflict caused by the Hearthfire DLC. All: Fixed the quest objective pointers for the house purchases. All: Town music has been fixed in the region definitions and should play properly when in the cities now. Windhelm: Fixed some markers and AI packs so Blood on the Ice will continue to work properly. Solitude: The crates and furniture on the porch of Proudspire Manor were not attached to the parent object for the house quest. Riften: The wrong duplicate door was removed in the previous update. Whiterun: Backed out changes to the Companions werewolf rampage (C03Rampage) and reworked the access point to it in order to remove a conflict with Dawnguard. Riften, Whiterun, Windhelm: Added woodcutters' axes at each chopping block where wood can be cut. Whiterun: The trigger box that is intended to unlock the gate wasn't 100% effective. Added a check for the guard dialogue stage to force the gate to unlock. Whiterun: Some of the patrol guards needed to have their linked references updated or they'd stay stuck in the closed city. 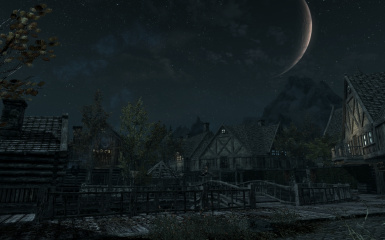 Whiterun: A few more marker problems sending people to the closed worldspace have been corrected. Riften: A duplicate door at Elgrim's Elixirs has been removed. Riften: Brynjolf's Falmer Blood Elixir bottles were not attached to the enable marker that cleans them up once the initial Thieves Guild quest is done. Solitude: During the tower escape for the Dark Brotherhood, Commander Maro will no longer be missing from the scene due to having been moved to the closed worldspace. Solitude: The quest marker for the Festival of Fire will now point to the correct worldspace. Whiterun: The script to deal with unlocking the city gate at appropriate times was accidentally left out. Whiterun: The Dark Elf gatesman had somehow been given sound data for giants, resulting in heavy breathing sounds near him. Whiterun: A gap in the stairway leading up to Dragonsreach has been corrected. Windhelm: The map markers for the city should no longer be shifted slightly out of position on the map. 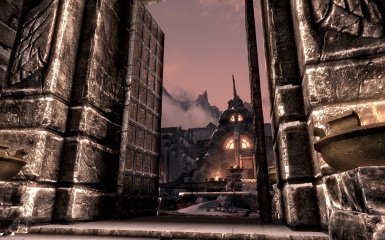 Windhelm: The door to Hjerim lost its key assignment and has been corrected. Recompiled all scripts from the mod to be sure they're in compliance with format changes introduced in Skyrim 1.6.89. Whiterun: When asked to train outside with Vilkas, the participants all ended up going to the closed worldspace instead. Whiterun: The argument at the gate for "In My Time of Need" will no longer be a one sided show with just the two Redguards and no city guard. Whiterun: The city gate has been tweaked so as to allow the civil war door flags to operate properly. It will also now lock and unlock itself at appropriate quest stages. Whiterun: The gatesman was not set in the right crime faction which allowed him to be freely slaughtered without the guards assisting him. Markarth: Tyranus and Yngvar will now be found waiting in the proper locations for their scene outside the abandoned house. Markarth: The scene with Endon, Karah, and Adara will now play out in the proper location in the open worldspace. Markarth: The city gate should no longer displace itself when the mod is uninstalled. Windhelm: The map marker should no longer be slightly offset from its counterpart in the closed worldspace. Windhelm: The two city gates should no longer be rotated 90 degrees off center when the mod is uninstalled. Riften: The fireball floating in the trees northeast of the city has been removed. Windhelm: Some markers for Blood on the Ice needed to be fixed. Whiterun: A necessary script for part of the Companions quest was left out and has now been included. All: Doors to the player houses will now properly complete the house purchasing objectives if a house hasn't been visited before installing the mod. Solitude: Stepping on to the execution platform after Rogviir is dead will no longer make the guards hostile. Whiterun: The city gate should no longer bar access during the Battle for Whiterun. Riften: A missing piece of wall was added in the area below the Mausoleum. New Material: Windhelm is now an open city. Whiterun: The Oblivion gate behind the Talos statue has been switched to the less obtrusive grey rock variety. Whiterun: Cleaned up several large floating rocks, and other rocks sticking through walls. Whiterun: Cleaned up some civil war debris objects that had been missed. Whiterun: The outer walls have been replaced with versions that don't have ridiculously tall collision, which will enable several new entry and exit points in the city. 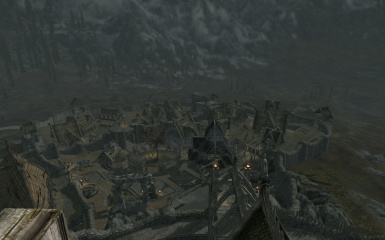 Whiterun: The city gate will now animate more smoothly and play its correct sound. Solitude: Added some crates to a section of battlement near the temple so the player can get out if they jump down to it. Riften: The Oblivion gate at the castle barracks was removed. A broken one in the harbor replaces it. Riften: The two city gates will now animate more smoothly and play their proper sound. Scrapped everything and rebuilt the entire mod due to corruption introduced in previous versions by TESVSnip. All: Gatesmen have been added to each city who will open the gate for you if you approach on horseback. All: Remnant Oblivion gates are now present in each city as leftovers from the Oblivion Crisis. Riften: Replacer meshes for the walls which will display the moss on the inside portions that wasn't present before. Whiterun: Updated the main gatehouse mesh so that the exterior side has all of the parts it needs. Whiterun: Shuffling of AI packs and NPC positioning has been done to smooth out some problems with the Companions quests. 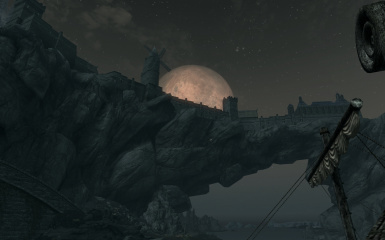 Markarth: Improvements have been made to the meshes on the inside of the city walls. Riften: Fixed a bug where some NPCs would continue to hang around the wrong worldspace due to an AI marker that was missed. Riften, Markarth: Adjusted some of the occlusion planes to squeeze out a bit of extra performance. Riften: Patchwork fix to keep one of the bridge pieces from vanishing until Bethesda can fix the static LOD bug. New Material: Whiterun has been converted to an open city. Open Cities Skyrim is a comprehensive project that aims to bring back at least part of the feel of Morrowind - specifically how most of the cities were a natural part of the world and you could just walk in without loading screens. The added immersion and realism goes a long way, probably a lot more than you might think. Ever wanted to ride your horse into the center of Riften? Well now you can. Need to get some help from the city guards to vanquish a foe? Run toward the gates and the guards will do their duty while you can seek safety within the walls. The town guards make for some very interesting interactions this way. This will also make running dragon battles that much more interesting since the flow of the battle won't be interrupted by the loading screen and all of the city guards can be involved at the same time. SKSE 1.6.9+ and SkyUI 3.2+ are required in order to use the in-game configuration menu. They are NOT required in general for the mod itself. SKSE 1.7+ is strongly recommended if you are having trouble with ILS/CTD issues. See the troubleshooting section. Use the "Download with Manager" button on the Open Cities Skyrim page at Skyrim Nexus. The installer should take care of things from there. Drop the Open Cities Skyrim.esp and Open Cities Skyrim.bsa files into your Data folder. Set the mod's load order using whatever management tool you feel most comfortable with. LOOT should set the proper load order, and is the recommended method for doing so. It may also be necessary to rebuild your Bashed Patch if you're using one. Once the game loads, you need to allow 24+ game hours to pass for AI to fully update in each city. You can configure three options using the in-game menu if you have SKSE and SkyUI 3.2+ installed. Option 1: Oblivion Gates. The menu will now allow you to toggle them on or off as desired, on the fly, with no external patches necessary. If you have any such patches, uninstall them. They'll crash the game now. Option 2: Gate Attendants. The gate attendants who open the city gates when you approach on horseback can be toggled on or off as desired. Yes, some people despised them enough to ask for this. Don't ask me why. Option 3: Outdoor Lighting System. You can toggle the state of the outdoor lighting system as desired. Nobody asked for this, but I figured what the heck. I was messing with MCM anyway so why not. These optional configuration elements will not be supported through any other mechanism, so if you're one of those people who irrationally hate SKSE and SkyUI, you'll have to live with using external patches for the gates, and you won't get to turn the other two things off at all. 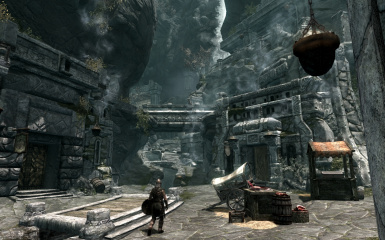 Open Cities Skyrim should be loaded as late as possible in order to preserve changes to navmeshes and other exterior city data. Official Dawnguard DLC - Available in the patch archive at the Open Cities Skyrim download sites (except Steam). Official Hearthfire DLC - Available in the patch archive at the Open Cities Skyrim download sites (except Steam). Skyrim Sewers 4- Available in the patch archive at the Open Cities Skyrim download sites (except Steam). 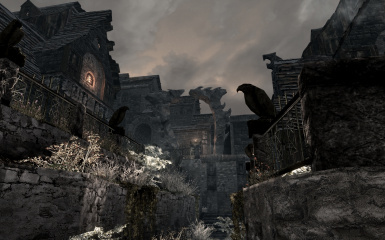 CL Cities - Whiterun- Available in the patch archive at the Open Cities Skyrim download sites (except Steam). Drinking Fountains of Skyrim - Available in the patch archive at the Open Cities Skyrim download sites (except Steam). Atlas Map Markers (scroll down the files tab a bit). Immersive Citizens - AI Overhaul - Included in Shurah's installer. Mods which strictly replace vanilla textures or the vanilla meshes are 100% compatible. Expanded Towns and Cities has been confirmed to be 100% compatible since it does not affect the 5 walled cities. Generally speaking, any mod which adds things to the closed cities will be incompatible. City mods that add some details to the open worldspace will be partially compatible. Alternate Start: Live Another Life - Fully compatible. No patches needed so long as AS:LAL is loaded after Open Cities. The Last Defeat of the Dragon Cult - The mod hasn't been updated since March 2012. It's navmeshes are partially corrupted and must be repaired. More Dynamic Shadows & Striping Fix - Numerous dirty edits that cause some interiors to cease functioning. The Civil War battles which take place in Whiterun, Solitude, and Windhelm will be fought within the closed city worldspaces. This had to be done due to complications that were not possible to overcome with the scripting involved in the war and how it relates to several other quests. Expect load door transitions when a city battle is underway. If you have a problem with an Open Cities mod and wish to report it, I'd appreciate as much information as possible, preferably in the form of a screenshot with console data showing if it's something that can be screened. The FormID of the affected object would help greatly to narrow down any problems that might result. Post this information along with your load order. Reports with less than detailed information may result in delays in getting it fixed, or result in being ignored entirely. It helps everyone to provide details. I am especially interested in verifiable conflicts, as I wish for Open Cities Skyrim to be as conflict-free as is humanly possible given the circumstances. If the situation requires a patch, I can only work something out if I know what to look for. Help! I'm experiencing Infinite Load Screens (ILS) and/or Crashes to Desktop (CTD)!!! In March of 2013, Bethesda released their final patch for Skyrim. Version 1.9.32.0.8. Prior to this, Open Cities Skyrim had little trouble operating in the available memory the game provided. It has since been found though that Patch 1.9 changed something about the way Skyrim allocates its initial pools of memory, likely due to trying to get the DLC to work on the PS3 and then not bothering to make sure the PC had, you know, PC specific code for that. The end result is that when traveling, either on foot or by fast travel, it becomes possible for you to run into problems with ILS/CTD issues. This is especially true in Windhelm and almost guaranteed to happen when trying to get back from Solstheim. It's also likely to happen when fast traveling from one city to another, and CTD may result when trying to enter some interiors after you arrive. This should resolve the problem on all but the heaviest of load orders. If you still have issues, then you can try either raising the 768 value to 1024, or install ENBoost which will help further reconfigure how RAM is used by the game. There are limits to this, so be careful. Skyrim can only have a maximum of 4GB even on a 64 bit system with boatloads of RAM. Allocate too much to either of the two SKSE settings and you'll be right back where you started with the ILS/CTD problem. My own load order has 96 active mods, and the SKSE settings alone turned it from totally unstable to fairly rock solid reliable. The doors inside Warmaidens (in Whiterun) are missing, what have you done with them! The More Dynamic Shadows & Striping Fix mod makes a bunch of dirty edits in Warmaidens that will cause the doors to disappear. This mod has several other problem locations as well and it isn't recommended to be used in general until the author fixes the problem. I am getting unexplained CTDs when using Open Cities with other mods. What gives? 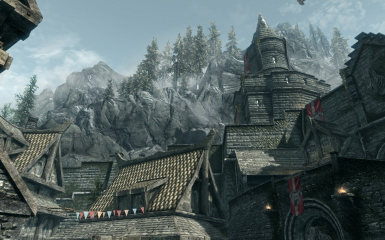 Open Cities Skyrim requires the latest version of Skyrim, Patch 1.9.32.0.8 as of the writing of this document. Many mods have not been updated since their creation. The most likely causes of issues will be from mods that have navmeshes but have not had them properly redone using CK 1.6.89 or greater. These mods need to be updated by their authors or they will simply not be compatible with the updated navmesh formats and will cause CTDs in any configuration that includes updated mods. When a mod is reported and confirmed to suffer from this problem, it will be listed in the Incompatible Mods section until such time as it is updated by its author. The AI doors are entry ways into the closed wordspaces should it become necessary. Not everything that is placed in a city by a mod is worth the time it takes to create a patch. Mods that drop items for a one-time pickup are a good example of this. It's much easier to just go through the door, get what you need, then exit the city as normal. Riften: East of the main city gate, next to the alley gate. Markarth: Enter the city gate, turn immediately to your right. The small rock in the grass patch next to the ivy. Whiterun #1: East side of the bridge into the city, right next to the brazier that is closest to the guard shack. Whiterun #2: North side of Jorvaskr, on the side of the path up to the Skyforge. Solitude #1: In the rock pile between the city gate and the executioner's platform. Solitude #2: In the rock pile across from the Bard's College, immediately to the south of the manhole cover. Windhelm: As you enter the city gate, turn immediately to the right, then immediately right again. It's in the bushes right next to the wall. Open Cities Skyrim should not produce a significant change in your frame rates and performance. Due to the liberal use of occlusion planes in the mod, the game will not render anything on the opposite side of the city walls in any given location. So your viewing content will be limited to roughly what you'd see if you were in the closed city worldspaces. The closed city worldspace system was NOT devised by Bethesda to improve frame rates. It was devised to conserve system memory on the XBox 360 and PS3. You're playing on a PC. Or, at least legally speaking you ought to be anyway. Anyone who insists that this mod is a framerate destroyer is already experiencing other problems with their game. Do keep in mind, Skyrim is not one of those silly shooters that requires 60fps at all times in order to be playable. Dropping from 60 to 55 would go absolutely unnoticed. Even playing with 30-40 frames would go unnoticed to those folks who keep those dumb little indicators running while they play. If you're seeing a massive frame rate drop, point the finger somewhere else. This mod is absolutely not the cause of your problems. I know this may seem harsh, but this sort of disinformation was rampant with the Oblivion mod and wasn't true then either and I absolutely will not stand for this sort of disinformation being spread now either. Nico coiN - Cut back version of the Whiterun drawbridge mesh as well as numerous other cleanups and fixes for the mod.